What is an allergy? An allergy is an inappropriate immune system response to any substance. For example, your immune system is programmed to respond to bacteria and viruses. This is an appropriate response and keeps you healthy. However, when your immune system responds to pollen, dust, cats or dogs this would be an inappropriate response. When your immune system responds it mounts an inflammatory reaction, which is what typically causes symptoms, such as runny nose, watery eyes, and itching. This immune response can also cause conditions such as asthma, digestive disorders such as IBS, skin disorders such as eczema or psoriasis, allergies to foods, pollen, trees, flowers, chemical allergies or sensitivities, and even migraine headaches! CARE Wellness Center now provides an innovative, advanced technology that relieves most allergy symptoms by reducing neurological stress responses within your nervous system. This technology is available via the BioVeda PTL II Laser. A consultation with the allergy specialist to learn more about this test is absolutely free! Once we determine what you are allergic to, we can successfully treat your allergies with our allergy elimination protocols using our laser system. Using laser light technology, our allergy specialists will stimulate points along acupuncture meridians that correspond with the major organ systems of your body, rebalancing and strengthening your body to reduce your response to external stimuli. This type of allergy testing and treatment has helped countless people greatly reduce their suffering and enhanced their quality of life. 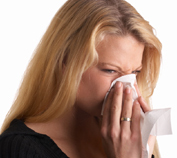 This treatment can significantly improve if not eliminate most allergy symptoms and sensitivities. If you have any questions regarding this procedure, or would like to set up a free consultation, please call us at (954) 586-8088. Learn more about our programs and about food allergy testing as well. At CARE Wellness Center, we take your health very seriously, and we truly believe our programs for allergy are second to none. If you have not been getting results with your Primary Care Physician (Rx meds), Allergy specialist (shots), Neurologist (Rx and scans), Gastroenterologist (Rx and scans), Dermatologist (Rx/creams), Pharmacy (OTC meds), or Health food store (nutrients), please come in to see us for a free consultation. We proudly serve the communities of Margate, Coral Springs, Coconut Creek and Pompano Beach.